Exciting Appeal Purchase for Chemotherapy Patients! Our appeal has been going brilliantly, thanks to the amazing support we’ve received from our community. As a result, we’ve been able to purchase an extra bit of equipment for the Lingen Davies Centre! We’ve funded the purchase of a PICC Line Placement Machine, which will be used in the chemotherapy unit at the Royal Shrewsbury Hospital. The PICC line is placed once and stays in the patient’s arm until all their chemotherapy is over. This avoids the need for staff to find an appropriate vein each time. Where patients have small or weak veins, or are very afraid of needles, finding veins each time can be difficult and uncomfortable. Using a PICC line means that chemotherapy can be delivered more efficiently and comfortably to patients who need extra help to receive their medication. Sister Jennifer Neill, who works in the chemotherapy centre told us that the new machine is state of the art and will make the placement of PICC lines much easier. The screen shows a clear image of the blood vessels in the patient’s arm. This means that the correct size PICC line can be established and the risk of problems such as blood clots are reduced. This purchase will also increase capacity for PICC lines to be used. 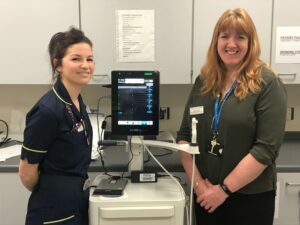 Previously, the chemotherapy team shared a PICC placement machine with the Haematology team. This could be inconvenient, for example when a machine was needed in an emergency, or when patients were requiring PICC lines in both departments at the same time. This led to delays in patients recieving treatment if the machine was already in use. The new machine will mean both the chemotherapy and haematology teams can work more efficiently. The team have trained up more staff to place PICC lines, to make sure the machine can be used to it’s full capacity. This machine will reduce delays and increase safety as well as lowering potential for pain or trauma in patients. The PICC Machine is now on site at RSH and we’re pleased it will be helping patients to received their chemotherapy successfully.